For Group Bookings Station Hostel will contact the Guest and issue and Invoice which needs to be covered 1 week prior to arrival either by Bank Transfer or Credit Card. We are located directly at the main train/bus station, 150 m to the famous Cologne Cathedral (Koelner Dom) and just a few steps from Germanys busiest shopping street,as well hundreds of Bars,Clubs and Restaurants.Colognes Trade Fair (Messe) is just 1 train stop away,or 15 minutes walk. We offer clean and comfortable beds (no bunks!) FREE bed linen, free showers, free internet and wireless access (in our Public areas )and laundry facilities.In our Bar, Beergarden and Restaurant we offer Breakfast and a varied evening Menu. All major sporting events can be followed on the Large screens,and a DJ and Live Music programme makes the Hostel Bar the ideal place to spend your evening. With our late check out at 11 Am there's no need to rush in the morning and our free luggage storage until 11 PM gives you more time to explore the city.Our reception is open 24 hours a day. Free city maps with sightseeing tips and local travel information, guide books and hostel flyers are available. Our friendly local staff are happy to help you with information about nightlife, restaurants, exhibitions and anything else you need to make your stay in Cologne an interesting and comfortable one. friendly staf, clean rooms, nice bar, good neighberhood,........recomanding place!!!!! Ik heb waar voor mijn geld gekregen, heel tevreden dus. 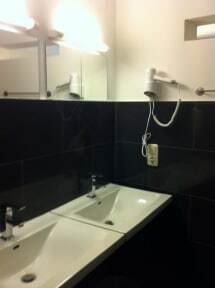 Nette kamer, handig om de lockerruimte te kunnen gebruiken. We hebben er bovendien 's avonds nog lekker en snel gegeten. Ik vind dit een aanrader. Had a great time, great location, went with a group so we had a 'private' place, sharing a room with strangers might make me want to use the lockers. Showers where not that great, lots of cold water. Would recommend to anyone that doesn't sit around their room all day. Also great bar! No real common room to meet other travellers. The bar was nice and I met some nice people there (expats living in Cologne also like to hang out there, which is nice!). No kitchen! Which would be a reason for me to choose another hostel. The location is great, and I was only there for one night so getting to and from the train station was very easy & quick. Loved that there was a pub quiz. Didn’t love my stay here: the staff were the most disinterested I’ve ever experienced in a hostel. They were more interested in continuing their private conversations than helping me. There’s not really an atmosphere to meet other travellers, and the WiFi only works in common areas. I don’t understand why the lockers are in the hallway, where anyone can get to them, when there’s plenty of space in the rooms. Location is great though!